I've recently witnessed people talking about getting the Excitebike games released for the Super Famicom/SNES modem-addon Satellaview to run on SNES flashcarts such as the Powerpak. These were Soundlink games, meaning that they were meant to be played live (hence the clock on the upper left) between 19:00 and 20:00 o'clock with music being streamed from the satellite uplink. 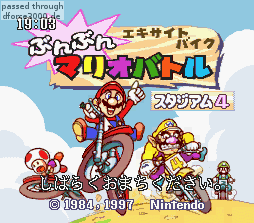 What I did as early as 2006 was patching one of the Satellaview Excitebike ROMs so that it behaves like a normal SNES game (and thus runs fine on the Powerpak) and making all the forced wait screens skippable by pressing start. The game consists of qualifying sections (also skippable), followed by races against opponents, a bonus jump contest and finally the total results.